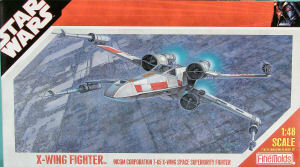 The Incom Corporation T-65 X-Wing Space Superiority Fighter is the fighter of choice for the rebel alliance and is an effective match against the Empire's principal fighter, the TIE. In the Star Wars universe, these craft were featured in several edge-of-the-seat battle sequences through the first three movies in the series (ironically identified as Episodes IV, V and VI). If you were to ask a Star Wars fan to name a spacecraft from any of the six episodes, the top two choices would be the Millennium Falcon and Luke Skywalker's X-Wing fighter. Fine Molds has taken on several subjects out of the Star Wars saga and the most impressive of the lot is the Millennium Falcon! This release is clearly building on the experience gained from the previous subjects from Fine Molds. 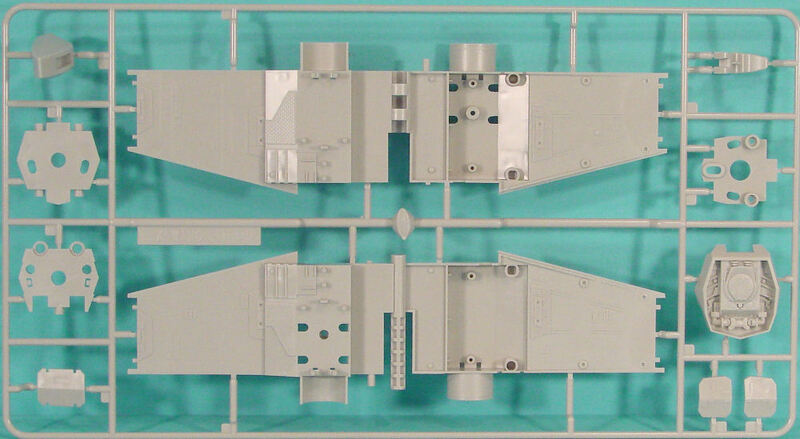 In fact, the first release in this Star Wars series from Fine Molds was this very same X-Wing - in 1/72 scale. 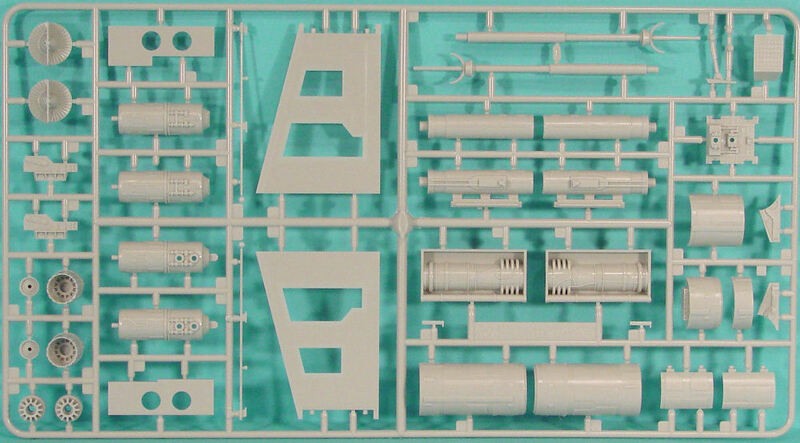 The kit is molded in a light gray styrene and presented on five parts trees (duplicate trees not shown). 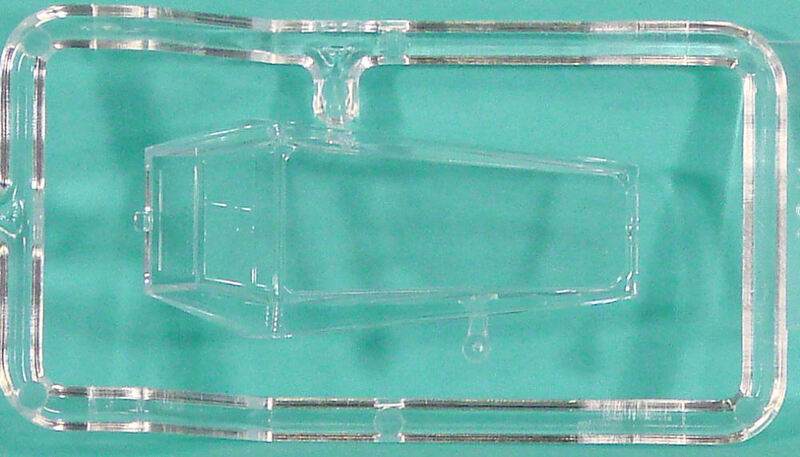 One additional parts tree molded in clear is also included for the cockpit canopy. The kit features some interesting engineering as Fine Molds went to a lot of trouble to ensure that you could fiddle with the S-Foils (X-Wing movement) as much as you'd like without worrying about the model falling apart. This kit uses a nice blend of snap-tite-like construction as well as screws at key places around the model to ensure a solid airframe. 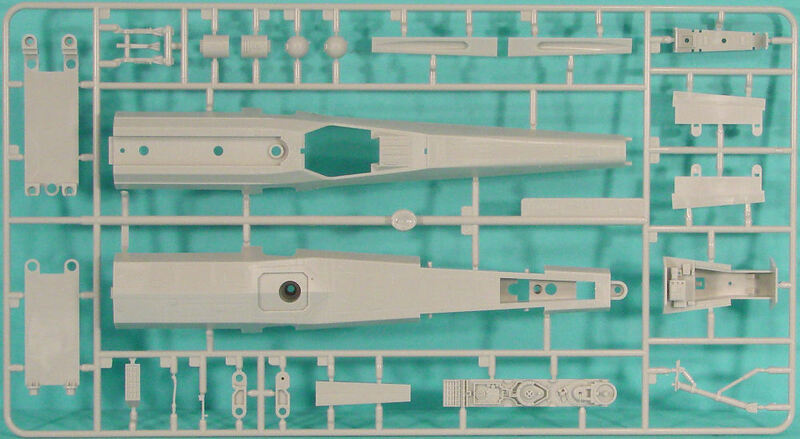 The S-Foils go together with lots of details for each of the four engines as will as for the outboard weapons booms. The main fuselage goes together around a nicely detailed cockpit and the S-Foil subassembly. The kit provides two head domes for R2D2 so you can mount one behind the cockpit and the other on a complete robot body to pose alongside your fighter. A pilot figure is also included to sit in that nice cockpit so your fighter will look natural in a flight pose. The landing gear can be posed up or down. Either way, you can mount the fighter onto a posable display base will adust the pitch of the fighter into three attitidues. The engineering in these kits improve with every release, and like the impressive Bandai Star Trek snap-together kits, this release is designed to be detailed without being overly intimidating. Nevertheless, I recommend that this is not a kit for young modelers unless they have some serious experience under their belts. While the kit would be very impressive if built unpainted, the real benefit will be from careful painting and attention to detail. 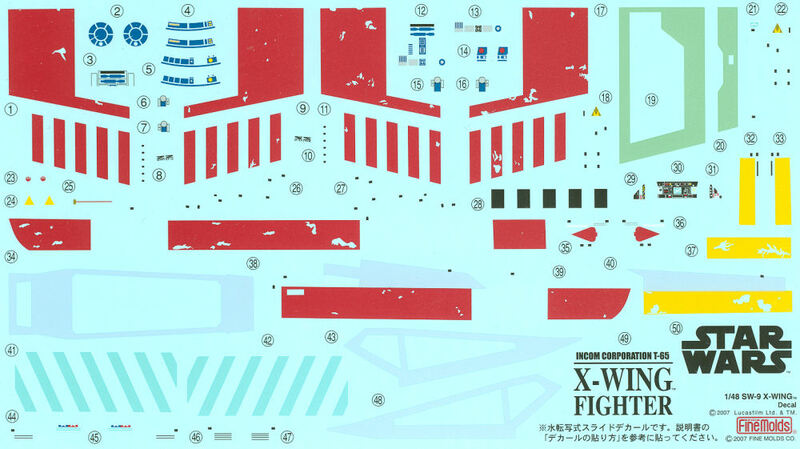 Markings are included to replicate the color's of Luke's X-Wing. This kit provides two sets of markings, one set (shown here) is standard waterslide decals while an identical set is provided as stickers. This is another impressive work of art in kit form. Congratulations go to the engineers and designers at Fine Molds who can transform a few partial sets and lots of CGI graphics into a three-dimensional model. My sincere thanks to HobbyLink Japan for this review sample!